More cowbell! 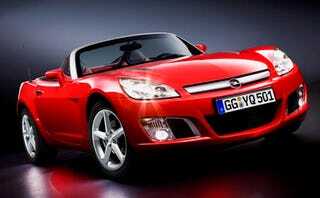 GM's Opel outfit released details and visuals on the Saturn Sky variant that will revive the Opel GT badge. Like the Sky Red Line, the GT will get GM's turbocharged 2.0-liter direct-injection four, producing 264 hp — good for a zero-to-60 time of 5.7 seconds and a top speed of 143 mph. It's been given the once-over by GM Europe's Design Studios in R sselsheim, which added a few Opelesque cues to highlight its association with the European brand's GTC sports line. The modern definition of an athletic two-seater finds its form in the new Opel GT. As a classic roadster, it has a powerful front-mounted engine, rear-wheel drive, a cockpit with sporty instruments and a tailor-made fabric roof. With a wide stance, sleek silhouette, long, front-hinged hood and short overhangs, the proportions are typical of this class. The Opel GT also brings new charm to this genre with its own unmistakable personality thanks to its exciting shape, which contrasts sharp edges with curved surfaces to create a dynamic look, and its configuration, which enables a refined driving experience, even on long journeys. The GT's pricing is also attractive. For 30,675 euros (recommended retail price in Germany incl. VAT), customers get no less than 264 hp from the high-tech turbo engine with gasoline direct injection. Acceleration from zero to 100 km/h takes less than six seconds. The new two-seater carries its legendary name because it continues the tradition of the first Opel GT (1968 - 1973) and, like the original, competes in one of the most exciting vehicle classes. The new Opel GT also showcases the brand's passion for dynamic cars, and the conviction that "Opel was never as young as today". This is underlined by niche models with a high fun factor, such as the Astra GTC with panorama windshield, the Tigra TwinTop and Astra TwinTop cabrio-coup s, as well as the high-performance OPC family. They enrich the model portfolio and emotionalize the brand. The development of the Opel GT is a prime example of transcontinental collaboration within GM. It stems from the decision to expand the concern's portfolio with a compact, rear-wheel drive, sporty vehicle architecture that can be implemented globally. The first step towards realizing this idea was the Solstice concept car in 2002, followed a year later by the Vauxhall VX Lightning concept, which was conceived at the GM Advanced Design Studio in Coventry, England. Strongly inspired by the VX, the Opel GT has been adapted to the current Opel design language at the GM Design Studio in Detroit and the GM Europe Design Studios in R sselsheim under the direction of Bryan Nesbitt. The Opel roadster will be built at the Wilmington/Delaware plant in the USA, where its highly successful American GM sister models, the Pontiac Solstice and the Saturn Sky, are also produced. The new GT's story is reminiscent of that of its classic predecessor. In 1968, the original Opel GT set an automotive manufacturing precedent in Europe when it became the first car to go into production after being debuted to the public as a concept study. The legendary American sports car, the Corvette, made the same start in 1953 in the USA. The new Opel GT shares some engineering characteristics with the current Corvette, such as part of the architecture. Sharp lines coupled with taut surfaces give the new Opel GT a crisp, dynamic look. Its strong face is dominated by the fender's accentuated sweep, the bold chrome crossbar with integrated Opel logo, the elongated hood with brand-typical center crease, chrome-bordered vents and bold 3-D headlamps in clear glass look drawn deep into the side panels. The GT's especially sporty characteristics include the long air vents in the hood, the grooving in the front fenders with their dynamic, Opel-typical horizontal contours like on the Antara , the double-pipe exhaust system and the twin air scoops behind the head restraints, which are reminiscent of designs from roadster and motor sport history. 18-inch aluminum wheels in new five-spoke design fill out the wheelarches, and emphasize the roadster character, as does the fabric roof, which completely disappears beneath a cover for open-top driving fun. Chrome-ringed instruments in the cockpit clearly display all important information, while black piano lacquer and chrome finishes accentuate the high-tech nuance of the surface structures. These all combine with optional leather seats with visible stitching to highlight the sporty ambience. The short gear stick adds significantly to the driving fun: directly connected straight to the roadster's five-speed transmission, its short gear travel enables quick gear shifts from the roadster-typical seating position. The new Opel GT does not just look quick, it is quick! Its longitudinally front-installed 264 hp engine with turbocharging and gasoline direct injection accelerates the roadster to 100 km/h from a standing start in just 5.7 seconds, and up to a top speed of around 230 km/h. "When it comes to high-performance roadsters, there is no better balance between price, driving enjoyment and fun," says Alain Visser, Executive Director Sales and Marketing, Opel. There's no question about it: no other Opel has ever produced 132 hp output per liter. The new Opel GT's engine not only complements the car's dynamic look perfectly, it also far outperforms today's other roadsters and most two-seat sports cars. High-tech features such as gasoline direct injection, twin-scroll turbocharger with intercooler, double camshaft phasing and twin counter-rotating balance shafts provide the basis for the 1998 cm3, four-cylinder engine's impressive performance data. Maximum output of 194 kW/264 hp at 5300 rpm and high torque plateau of 353 Nm between 2500 and 5000 rpm ensure plenty of power in all situations. The GT requires an average of 9.2 liters of super unleaded gasoline per 100 kilometers. Jointly developed by GM Powertrain engineers on both sides of the Atlantic, the all-aluminum ECOTEC unit is based on the 2.2-liter direct injection unit available in the Vectra model range since 2004, and on the 2.0-liter turbo induction unit, which debuted in the Vectra GTS in spring 2003. For the Opel GT, engineers designed a classic, sporty configuration based on a rigid chassis, wide track (front/rear: 1543/1561 mm) and long wheelbase of 2415 mm: all four wheels are suspended from twin A-arms made from forged aluminum, the center of gravity is low, and the weight distribution of 51:49 percent (front/rear) is well balanced. A manual five-speed transmission with sporty, short gear travel and limited slip differential provide propulsion power. A torque beam between the transmission and rear axle suppresses reactions to acceleration/deceleration effects. While disk brakes on all wheels, ABS, Traction Control (TC) and the Electronic Stability Program (ESP) monitor safety, the driver can control the level of ESP and use of TC himself. Both systems are fully active after ignition, with the setup providing driving fun but also keeping the vehicle stable within the physical limitations. At the touch of the ESP button in the instrument panel, the Traction Control (TC) is switched off, but ESP remains active and intervenes as soon as the yaw angle exceeds certain thresholds. Two short presses change the ESP's calibration to a sportier mode and keep the Traction Control (TC) deactivated. Pushing and holding the ESP again for around ten seconds until the "ESP Off" symbol illuminates, completely deactivates ESP and TC. A short press of the button in any mode returns the two systems to their normal states, which also occurs automatically with each new engine start. A display and control light in the instrument panel keeps the driver informed about the current status of both systems. The typical roadster vehicle architecture was designed from the beginning to meet the special demands of an open-top, two-seat sports car without compromise. The vehicle structure, which consists of hydroformed side members and a supporting center tunnel made from drawn sheet steel, provides a solid basis for the car's precise handling and passive safety. The hydroforming forging technique, in which components are manufactured from steel with the help of high water pressure, is already employed in automobile construction for chassis components in the Opel Vectra and Astra. Only the legendary American Corvette sports car is also based on hydroformed side members. But the Opel GT also breaks new ground in another regard: the GT model family belongs to the first car line produced in significant numbers to have numerous exterior parts made using a procedure that is relatively time-consuming, but provides designers with greater creative freedom. The hood is one example: thanks to unconventional hydraulic technology known as super forming the long hood section with its front hinges was optimally integrated into the roadster's silhouette without a gap between the hood and fender. The first Opel GTs will be on the road in March 2007 and dealerships have been accepting orders since summer 2006. All data refer to the European base model with standard equipment. The consumption data according to 1999/100/EU takes into consideration the vehicle's curb weight as stipulated by this regulation. The published performance figures are possible with the vehicle's curb weight excluding driver plus a 200 kilogram load allowance.